My name is Sasa Pueblo and I live in Slovakia. I have been doing healing and spirituality over 25 years. My grandmother was healer and herbalist and I decided to continue in this tradition. At beginning I used to heal traditionally and I traveled over Slovakia. Later I have decided to practice meditations, therapies and healings on distance. I have found own Reki school TIANTAI REIKI. I also do clairvoyance techniques on distance without photography, my clairvoyance techniques are based on name and surname, alternatively brief description of the person. I combine clayirvoyance techniques with knowledge from medicine in the field of diseases diagnosis. So in my practice I stand between medicine and alternative healing, between spirituality and psychotherapies. I am polymath, educated in all scientific, social, technical and spiritual directions. It also provides a good basis for an overall understanding of potentials and possibilities of mankind. I do distant healing without the presence of the person being treated from the year 2014 and I constantly improve in this field. I study and take over healing techniques of the best in that area. In the year 2017, I have treated about 140 people and some of them have already received 120 Reiki treatments. I only recorded a few who treatments leave, most of them remain and they have been constantly treated for many years and kept in excellent condition. Here is distant Reiki treatment focused on longevity. Within longevity I am conducting clairvoyant research and connection with distant Reiki. I do distant attunement without the presence of the person. First of all, I usually do clairvoyant diagnostic on whether the patient is healthy enough and mentally balanced to receive Reiki attunement. I improve my Reiki attunement and I learn to do distant attunement in my best. 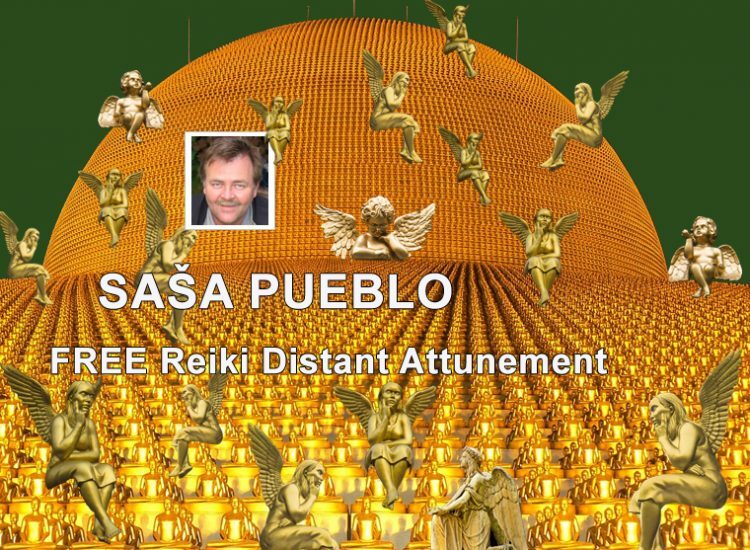 I also study those who provide distant attunement and I have found that they do the best attunement for persons who have enormous amounts of colloidal gold, have spiritual approach to the gold and never think and talk about gold as price. After about 25 years of researching and practicing healing and esoterics I decided to realize everything on Reiki platform. It happened in 2014. Based on my clairvoyance potential I recognized that Reiki platform allows us to practice all other systems of healing, esotericism, religion and I haven´t found other system which would tolerate all that areas. And today, in 2017, I do not regret this practical decision and I recommend the same to everyone who wants to mean something and succeed in the area of healing and spirituality. All systems of spiritual world can be practiced in Reiki, I only had to adjust clairvoyance techniques to something like spectrography, where the object is being treated with microparticles and information is obtained. Classical clairvoyance techniques based on low energies did not allow something like that. And so you can do everything on Reiki platform. I have studied Reiki history and I have discovered Tiantai Reiki practiced in desert Gobi and I have brought this kind of Reiki into life. This Reiki stands on meteorite energies and it´s rather about practical understanding of spirituality named diamond sutra. This Reiki is located in front part of the body. These parts are called chakras. The principle of this level is based on meteorites and connections with people who work with meteorites or collect meteorites. Second level are chakras on the back and here is the basis spiritual perception of the gold. Here are gold Reiki characters as kind of movement body and hands. Gold character of lightening is located on the back. Third level goes to tiny chakras which are on groups of cells over whole body and attunement is here represented as shamanic tree with the jin – jang symbol. Here are of course other levels, but we´ll talk about them after mastery of basic levels. I have reviewed all possible Reiki schools over whole world and I have done special research in China and Japan. I have prepared the way for application of experiences from currently existing schools into Tiantai Reiki. I am extremely versatile and I am able to accept all other Reiki schools and all other healing practices. I would like Reiki platform to showcase possibilities for all healing and spiritual systems. I do intensive research of practices applied in Reiki but also in SRT (Spiritual Response Therapy). I also do unique research of Philippine healing, angelic techniques and shamballa techniques. So there is a peculiar research and applied practice for doing everything at distance. I’m open to share my experience for everyone. I did not come to distant Reiki healing because of business but because the spirituality. I do not even avoid common long distant healings and clairvoyance diagnostics. I like to accept any cooperation in the benefit of Reiki community. Maybe I’ll surprise you, there are many people in TIANTAI REIKI who work and do development in the area of technical intelligence. And you will be surprised that I have been doing on such type of Reiki where it works as automat for health and spirituality. So that newcomers do not have to go through everything from beginning until they don´t reach decent level. And so, within the framework of Reiki treatments, I can develop Reiki Intelligence which is able to interfere by itself. It’s not about treatment, but about the development of artificial intelligence in Reiki itself, something like bio Reiki robot. And you will gradually see that this works more and more. I write this to draw your attention to TIANTAI REIKI which will be significantly different from other Reiki schools. Be sure to get on this smart Reiki platform. I offer attunement into TIANTAI REIKI for free. This system already contains the best practices for healing of you but also for healing of other people. So here belongs angel healing, Reiki 1,2,3, then Reiki set shamballa, ayureveda, brahma, Tai-chi, Reiki set Mikao Usui, set Chujiro Hayashi, Hawayo Takata, SRT and other systems. It is setup so that this system constantly heals you and you can also heal other person. It’s intelligent Reiki which has inside something like artificial intelligence. You do not have to do anything about treating yourself and while treating another person on distance, you only draw small character on the paper with the name and surname of the person being treated and you only need to have desire to help. Distant Attunement into this complex. I repeat attunement in the period of 2 month and I adjust attunement during this period 10 times in order to make distant attunement solid. You receive the message about attunement in the mail. All this is free. This package for your TANTAI REIKI includes checking your Reiki attunement, fine-tuning it and verifying that it works. Adding updates or conditioning training hours for healing other people. I check to see if TIANTAI REIKI correctly treats you if you need to set deeper or more precise treatment. Alternatively, it is possible to check the efficiency of particular distant treatment. This zone is already paid, but there are no big fee. Rather, it is a symbolic fee that does not exceed 10, 20, 30 Euros per month. If you want to ask something, clarify something, you do not have to hesitate. Please fill in data in the attached table. If you don´t want, you do not even have to give your full name and surname, your initials and age are enough. You can also write the location where you live. Please keep the state where you live. My seriousness is guaranteed.